Getex recently completed monitoring of a large scale hazardous materials removal project underway out of hours in a highly sensitive setting (a commercial retail store). Project activities were carefully managed in close consultation with the client. The project was implemented to ensure that no disturbance to normal operations on site occurred and that customers were not placed in danger or inconvenienced. Of utmost concern at all times during the project, was helping the retailer to protect public health, ensuring the safety of employees, contractors and visitors. All removal works were undertaken by the specialist hazardous materials contractor in accordance with the relevant Australian Codes of Practice. A “Control” air monitoring program was put in place by GETEX and all air monitoring results obtained throughout the project were below the applicable Australian hazardous materials guidelines. The store had to maintain its operational capability, and hence the project was dissected into smaller areas. 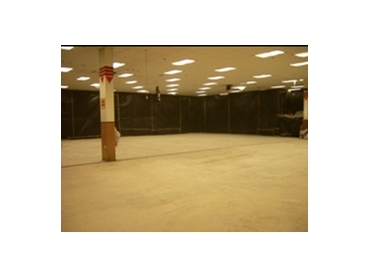 Each area was isolated from the adjacent “selling” floor by a floor to ceiling hoarding which was then lined on the inside with 200µm plastic sheeting to ensure the hazardous materials were separated from the public areas. The removal of the hazardous materials took place at the near completion of the first stage. These hazardous materials were removed and placed into double lined plastic bags for transport at the end of the project stage. A non-toxic and organic based solvent was allowed to penetrate the adhesive (hazardous material) and then removed through hand held scrapers, immediately placing removed residues into 200µm plastic bags which were then sealed to await transportation and disposal. Professional hazardous materials removalists undertook the final clean using industrial vacuums fitted with a HEPA filter. All residue material was treated as hazardous waste and disposed of appropriately. Getex Consultants reported satisfactory clearance inspection and monitoring results for this area, thus allowing it to be released for normal building works to proceed.